An Ohio city voted to protect Lake Erie by granting it rights similar to humans’. Investors managing $6.5 trln want fast-food giants like McDonald’s to reduce suppliers’ pollution. It’s welcome pushback against lax business practices and President Trump’s environmental neglect. 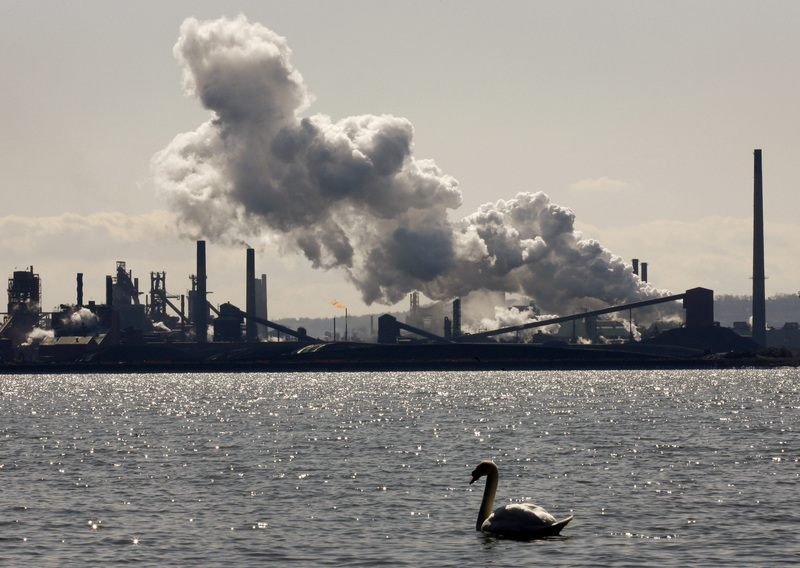 Steam billows from a stack at the U.S. Steel Canada plant, formerly Stelco, in Hamilton, March 4, 2009. Residents of Toledo, Ohio, voted in favor of adding a Lake Erie Bill of Rights to the city’s charter in a special election on Feb. 26. Some 61 percent supported the measure. Overall turnout was just under 9 percent. The push for the measure started after some 400,000 residents in 2014 were told not to use their tap water for three days after agricultural nutrients and other runoff produced harmful algae blooms. Some 100 citizens were taken ill. The city has since invested around $1 billion in its wastewater system to tackle the algae blooms that now affect the lake most summers. On Feb. 19, the U.S. Supreme Court justices agreed to hear the case of the County of Maui, Hawaii v. Hawaii Wildlife Fund. The case revolves around whether pollution that seeps through groundwater before entering navigable waterways is subject to the 1972 Clean Water Act. On Feb. 14, the U.S. Environmental Protection Agency and the Department of the Army proposed to reduce the number of waterways that fall under federal jurisdiction in draft revisions to the Clean Water Act’s Waters of the United States rule, put forward by former President Barack Obama in 2015. On Jan. 29, a group of more than 80 investors managing $6.5 trillion in assets pushed fast-food companies to set targets for reducing their meat and dairy suppliers’ greenhouse-gas emissions and water usage. The coalition includes Aegon Asset Management, Aviva and BMO Global Asset Management. The companies they are lobbying are: Chipotle Mexican Grill, Domino’s Pizza, McDonald’s, Burger King owner Restaurant Brands International, Wendy’s, and Yum Brands, which owns KFC and Pizza Hut.